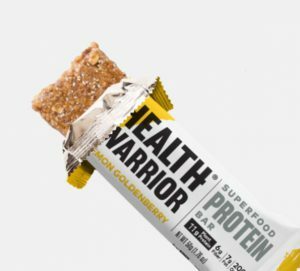 The Health Warrior Protein Bar is called a “superfood” bar. Although there is no standard criteria for superfoods, superfoods are considered nutrient dense foods that are especially beneficial to our health. Superfoods include whole grains, legumes, nuts, seeds, fatty fish and fruits and veggies. The Health Warrior Bar includes several of these superfoods–specifically chia, oats, quinoa and almonds. The Health Warrior Protein Bar is a great option for vegans (except the Honey Almond flavor), vegetarians and women looking for a healthy bar with a good balance of protein, sugar and fat. The Health Warrior Protein Bar is unique in texture and taste. It has a chewy-seedy consistency. If you are not used to chia seeds then this bar may be a surprise .After the initial unusualness, most people get used to the seeds. I had not experienced chia seeds before eating my first Health Warrior Protein Bar. These bars do have a lot of seeds! But what I found even more surprising was the tartness. I tried the Peanut Butter Cacao first. I didn’t expect tartness in a peanut butter flavor. It has a good flavor, but a bit different. The tartness comes from the golden berries. I had never tasted them before either. It’s a tart dried fruit in all flavors of the Health Warrior Protein Bar. After trying the other flavors, I found they all have this tartness. Some people don’t care for it. I like all the flavors. My favorite is the Lemon Goldenberry. This flavor has the most tartness. My next favorite is the Peanut Butter Cacao. I was disappointed in the Honey Almond flavor. Although it has a good flavor, it’s a bit mild and doesn’t really taste like almonds. The Mint Chocolate has a nice minty aftertaste and the Dark Chocolate Coconut Sea Salt is the most chocolaty. But, if you really want a strong chocolate flavor, the chocolate flavors of the Health Warrior Protein Bar may disappoint you. The golden berries dominate. 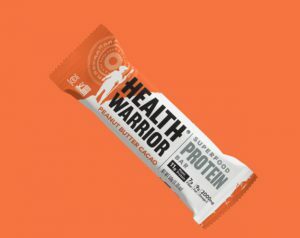 Made with natural ingredients and plant based protein, the Health Warrior Protein Bar is a great option for vegans, vegetarians and women looking for a healthy bar with a good balance of protein, sugar and fat. Although the golden berry tartness is a main feature of these bars, many people find the new taste quite good (including me). I’d love to hear your opinion on the Health Warrior Protein Bars.